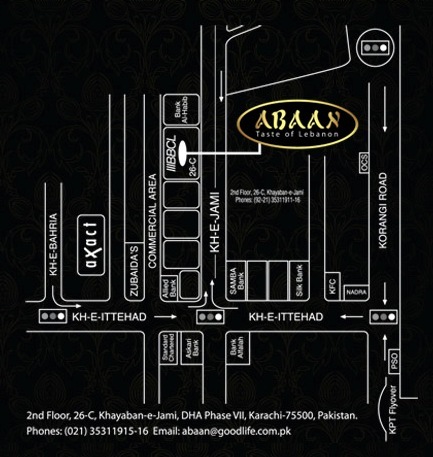 Abaan is a Lebanese restaurant that has opened up recently in Karachi to cash in on the growing Pakistani interest in Middle Eastern cuisine. Although a handful of Arabic cuisine restaurants exist in Karachi, almost all of them are open-air cafesque types. What’s more they aren’t the upscale types a la Zamzama. Although they do offer some semblance of Lebanese cuisine, they aren’t predominantly Lebanese. Kababji in Sheraton was the only premium Lebanese restaurant in Karachi. Now enter Abaan, which aspires to offer stiff competition to Kababji. And judging by the initial response it’s getting, it can prove to be a star in the making. We checked the place out on a Saturday night. And it passed the litmus test, for a sizeable crowd on a weekend gives you a rough idea that the place will not crash and burn before it even takes off. The initial response Abaan is getting is due to two major factors: one, it has advertised in Dawn and second it has a Facebook page with around 116 fans. Most of them will check the place out at least once, and if it’s any good, will refer it to friends and family as well. Secondly, it is the only restaurant in Karachi where you can consume Arabic/Lebanese cuisine in an upscale setting. Apart from Sheraton’s Kabab ji, there’s no other A-list restaurant catering to this segment. As such this is an attractive niche that Abaan has positioned itself in. However, it’s survival in the long run will depend upon a couple of critical factors. The biggest of them is the location. Even if the owners couldn’t afford space on Zamzama or the rapidly developing food avenue on Khayabane Shahbaz, they could at least have rented space in some other happening commercial district, even Khayabane-Ittehad would have sufficed. Khayaban-e-Jami maybe a major link road, but it doesn’t have any restaurant or even any other major shop. If this wasn’t enough, Abaan has opened up in the office of advertising agency BBCL. When you enter a restaurant, the last thing you want to see is an office and a photography studio. But that’s precisely what you’re faced with upon entering Abaan. The actual restaurant is on the 2nd floor of BBCL’s office for which you’ve to take the elevator. Spoils the ambience right then and there. First impressions being everlasting is an adage that still holds true. Another major shortcoming is the space or lack thereof. Although the ambience is acceptable with some Middle Eastern elements thrown in for good measure, the layout of the place is too stifling. If it was Zamzama where the rent is sky-high, it would have made sense to keep everything close, like most other restaurants on it. But when you’re far away from the madding crowd, you ought to conjure up a spacious layout, where there’s ample privacy for each table. Finally, the biggest problem Abaan will face is that of repeat customers. The thing is, a restaurant of this caliber (and stiff prices) needs select loyal customers who can afford to dine at the place multiple times a week. And most of these customers will be found on the Facebook Group SWOT where as many as 900 foodies share their experience of eating out. “I went to Abaan for dinner last night. The ambiance was nice we were promptly greeted and seated. We ordered the following dishes the Mezzeh platter for starters. And for the main course I ordered the chicken Shawarma and my wife ordered the chicken liver and sheesh Taouk and both of us ordered Liban as our drinks. We decided to check Abaan out after reading this review. Yes, there are glitches in the presentation and quality of food but it’s not as bad as this review projects. We started off with the assorted Mezzeh, which encompasses pretty much all the Arabic appetizers- hummous, tabouleh, mutabbal, baba ganoush, feta cheese the works. At Rs.450 exclusive of 17% GST, it’s a bit stiff. Hummous was delectable but we felt it was way too tangy similar to the moutabel also called baba ganoush sometimes. Tahini seems to be missing from the ingredients which was evident from the texture of hummous. Although there’s no standard taste of hummous with numerous variations available throughout the world, still the majority refrain from making the hummous sour. The Shish Kabab had French fries strewn all over it! It comprised of two skewers of lamb cubes which were charcoal grilled, a single skewer of grilled vegetables and a pita bread. Then there was the garlic sauce along with cucumber mint yoghurt. Priced at Rs.495, the serving size could have been much better. On top of that, the surface of lamb cubes was charcoaled excessively while the inner was slightly raw. This points to the fact that the grilling was done in a hurry, which is baffling considering that the food was served a good 25 minutes after the order was taken. On the face of it, that’s not bad, because some people prefer it that way- well done on the outside and slightly raw from the inside. However, not everyone is enthusiastic about this arrangement; therefore the waiter ought to ask how the customer prefers his meat to be done. All in all the dish was palatable, and the garlic sauce played a major role in tilting the odds in the favor of the dish. Service could have been a whole lot better. When they served the Mezzeh, they provided only one pita bread and didn’t mention that the refills were free. Only later when the main course had arrived that they brought another pita bread as a refill, which was too late. Then they took their own sweet time revving up the generator when they lights went out. Even then they were indecisive, trying feebly to light up a candle as an afterthought. Only by then the generator had started. It would have been better had they lit up the tiny candles that were already placed on every table. That way the place wouldn’t remain shrouded in total darkness if the generator doesn’t fire right away. The Abaan special ‘Kasbah’ was appalling. It was basically rice with tiny pieces of what seemed like boiled chicken and pieces of almonds mixed in. There was literally no distinct taste in it. And at Rs.195, the quantity wasn’t up to the mark. If you’ve had this cuisine in the Middle East and yearn for the same taste, Abaan is not for you. But if you’re simply looking to devour Arabic cuisine in a proper restaurant as opposed to the makeshift arrangements of Damascus and Arabian Nights, then Abaan is your best bet. Although Kabab Ji at Sheraton fares much better, price-wise Kabab Ji is way too exorbitant and you’re better off checking out Abaan which offers better value for money. i dont know man, i wanted to check out abaan, but at the prices i cant say poorly cooked kebabs and disappointing rice dishes are justifiable. btw go to deli, eat their mezzeh platter, amazing! 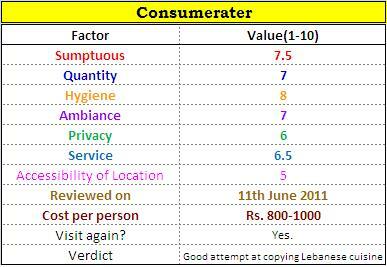 There have been equal number of good and bad reviews I’ve come across regarding Abaan. My biggest gripe with the place is that it’s not authentic Lebanese. If you can live with that, you should definitely have a go at it at least once. Just choose your dish wisely. Check out this Sunday’s Dawn Magazine which carries a review of Abaan. Yes, I’ve heard about Deli’s mezzeh platter. But not in so many good words. Reckon I’ll have to go and see for myself.